For decades, General Motors has played a game of "just the tip" with our wildest dreams by teasing us with visions of a mid-engine Corvette. That goes way back to the early 1960s with the CERV II, or Corvette Experimental Research Vehicle. Now that car can be yours. As our friends over at Road & Track report, the 1963 CERV II is set to sold to the highest bidder at RM Auctions next month. 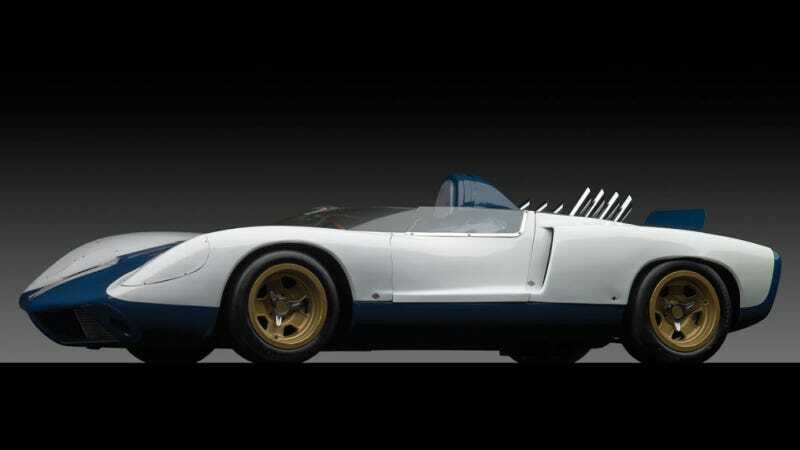 A successor to the 1959 CERV I prototype, which looked like a Grand Prix car from that era, the CERV II packed a 377-cubic-inch small-block V8 with 490 horsepower right behind the driver. It was also decades ahead of its time in one big regard: it had all-wheel drive. The CERV II was meant to be a competitor to the Ford GT40 in racing, but sadly, that never happened. Still, styling cues from this car — as well as its engine — later made it to production cars. At some point around 1970, R&T says, the CERV II was fitted with the engine it has now, a ZL-1 427 big block with some 550 horsepower. Supposedly the car could top 212 mph and do zero to 60 mph in 2.8 seconds. Not bad. Not bad at all. We'll be very eager to see how much the CERV II fetches when it goes to auction in New York next month. I say it deserves a good home.